From the beginning, our goal has been to make WPForms the easiest and most powerful contact form plugin on the market. 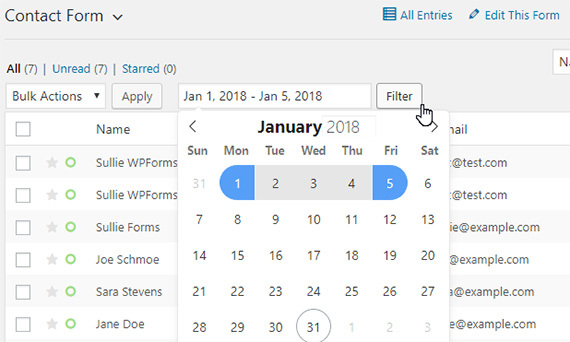 Today, we’re excited to announce the latest release of WPForms with new features that make it more powerful than ever. We know you’ve been eagerly awaiting this one. 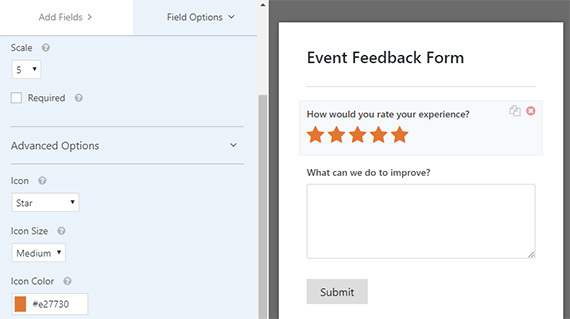 A lot of you have asked us for the rating field, and it’s now available in WPForms. It’s completely customizable (and totally beats the pants off of all our competition – not that we’re biased 😉 ). Our devs did an awesome job on this one! It even works with conditional logic, so you can show or hide other fields based on the user’s rating. The new rating field is available to Pro license holders. For more details, see our documentation on how to add a rating field to your WordPress forms. In the last release, we quietly made some changes to the database structure that WPForms uses to store entries. The new structure helps us better organize your data. To check out all the options, see our guide on how to search and filter your form entries. 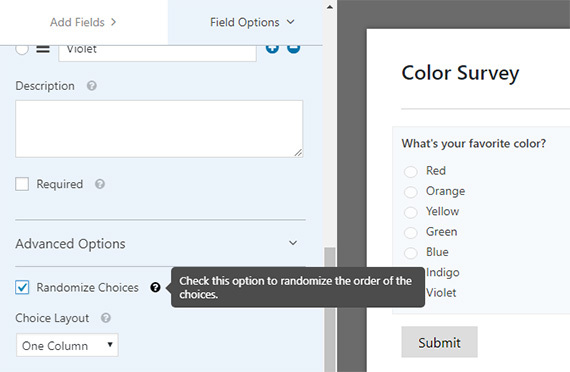 There’s also a new advanced setting for Multiple Choice and Checkbox fields to randomize choices. 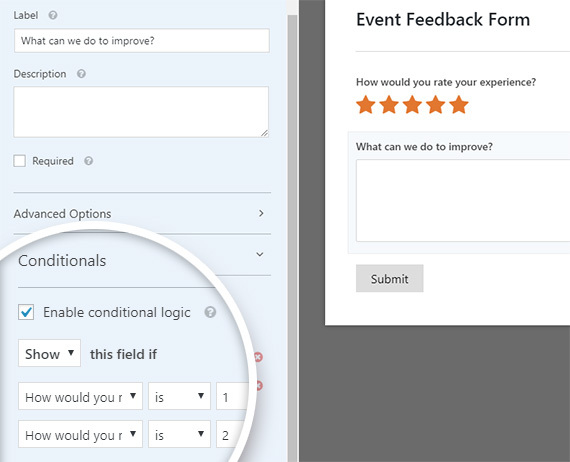 Most of the new features in WPForms 1.4.4 are laying the groundwork for our upcoming new addon: Survey and Polls. With the Survey and Polls addon, you’ll be able to unlock the true power of the new ratings field. Plus, being able to randomize multiple choice and checkbox fields will help you to get more accurate results from your surveys and polls. The Survey and Polls addon will be releasing soon, so stay tuned to the blog and be sure to follow us on Twitter to be the first to know! As always, thank you for your support. We hope you enjoy these features and look forward to bringing you more updates soon! Still looking for an easy way to publish a form’s entries to a page. Thanks for all you do to make this product what it is today. In case it helps, we do have a tutorial with custom code for displaying entries. That doc shares all the setup details, as well as a screenshot of what the result would look like. And in case it helps, here’s an additional tutorial on how to add custom code to your site. Nice features but there are a couple of basic features that should have a much higher priority than this. In my opinion WPForms (which I love) HAS to add a formatting feature for the number field so it can add a ‘,’ on large numbers. The number should be 2,000,000 instead of 2000000. Also MUST have the ability to calculate using numbers supplied. Assuming field one and two are number fields you should be able to calculate field three by adding field one and two together (or multiplying, etc.). This is basic but critical needs. Without it I’m going to have to re-write over 50 forms using a competitor. The number formatting feature is already available. Simply add the `wpforms-payment-user-input` class to a Single Line Text field (in the Advanced options) and you’ll be good to go. Custom input masks are on our short list and we look forward to having those available in a future update. Dynamic calculations are not on our roadmap at this time. This new features look amazing! For me the “filter” options, specifically for dates, is the best! I currently use the plugin to send leads to clients, so the monthly filter will be very useful for reporting. We don’t currently have the option to auto-send CSVs, but I’ve added your vote for this to our feature request list. Our team will keep that idea in mind for the future. Could we have an add-on to allow the viewer to print the form? This is great! The rating functions we will be utilizing very soon! Is there anything in the works to POST/GET certain form fields to a third party site? On that note, if we could change the id of the fields being sent to a third party site would be awesome! For sending data to external services, I’d recommend checking out this tutorial from Bill Erickson. He shows a pretty neat, clean method that will hopefully help achieve what you’re looking for. Hi! We are using your plugin and now we want to create polls with the addon and integrate it with advance custom fields. It is possible? We’d be happy to help you determine whether our addon can accomplish what you’re looking for. When you get a chance, could you please get in touch with some extra details about what you’re looking to do? I’m happy to see that filtering and searching options for entries finally arrived 🙂 However they’re not working for me. No matter which filters or search terms I use, the list of entries stays the same. The list shows all the entries and doesn’t seem to consider my search terms. Do I miss anything? Do I have to change any options? I’m sorry for the trouble. That’s definitely odd, but we’d be happy to help! When you get a chance, please submit a support ticket so we can assist.